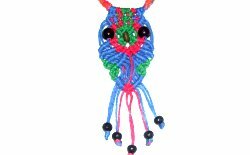 Description: The Rainbow Owl is similar to the Owl Pendant, also listed in the Micro-Macrame section. The primary difference is at the bottom, which includes a diamond shape. The cords are finished with beads rather than a stick. 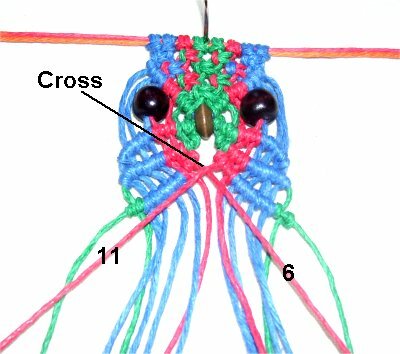 This Macrame design features multiple colors to produce a rainbow effect. You can use any number of colors and arrange them how you wish. 1mm size Hemp material was used in the example shown. 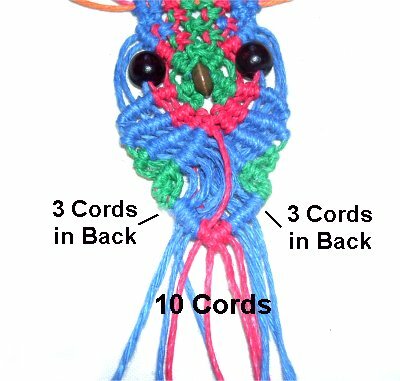 Since only basic Macrame knots are used to make this owl decoration, this is a good project for beginners who have some experience. 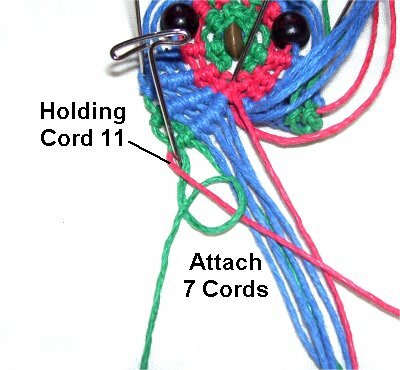 Cutting Instructions: Cut two or more cords for the necklace, which the Rainbow Owl will be attached to. You can usually take your neck measurement and multiply it by 4 to get the proper length. For the owl, cut a total of 8 cords, each 36 inches long. Use any combination of colors. 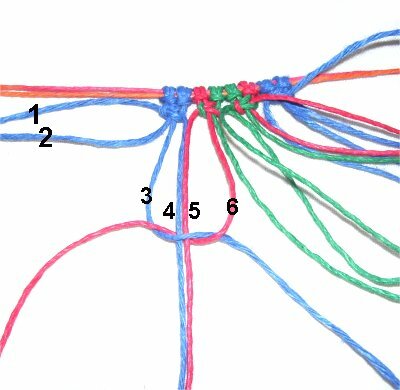 In the example shown, there are 4 blue cords, 2 green cords, 2 red cords. Fold the cord in half and place it under the necklace cords, with the fold towards you. 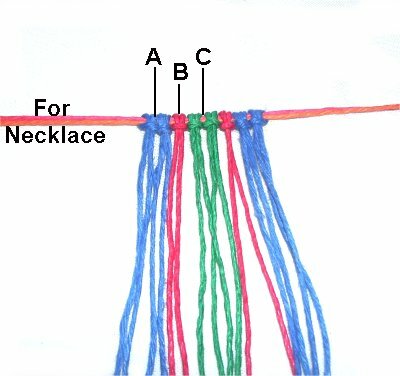 Bring the ends over the necklace cords and under the folded area of the cord you are mounting. Arrange the cords any way you wish, as you mount them. Start at the center, and work in both directions, so the cords are balanced. Step 2: Separate the 16 cords into groups of 4, and mentally number them. 5 - 8, 9 - 12 and 13 - 16. The SK should be tightened firmly, so they rest against the Larks Head Knots. Do not use cords 1, 2, 15 or 16 for this row. 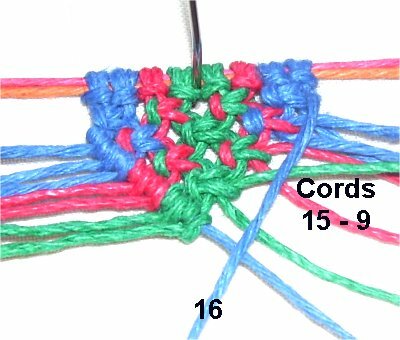 Step 4: For the next row of Square Knots, use cords 5 - 8 and 9 - 12 only. The last SK at the point of the V pattern is tied with cords 7 - 10. Step 5: Move cord 1 down the left edge of the ASK and secure it with tension, since it will be used as a holding cord. 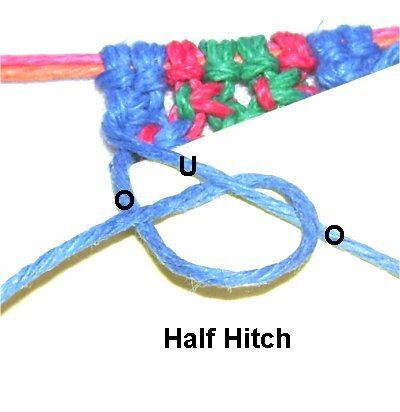 A Half Hitch is tied by moving the working cord over and then under the cord holding the knot. Pass over the working cord as you pull it to the side. Tie a second knot, to make a Double Half Hitch. Step 6: Move cord 16 diagonally, along the right edge of the ASK, and secure it with tension. Attach cords 15 - 9 to it with DHH (in that order). Step 7: Pass cords 1 and 16 through the narrow bead for the beak, in opposite directions. 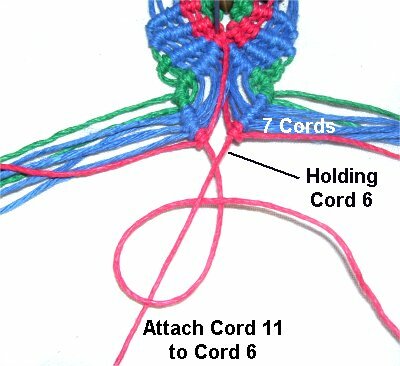 When you are done, cord 1 will be on the right, and cord 16 on the left. 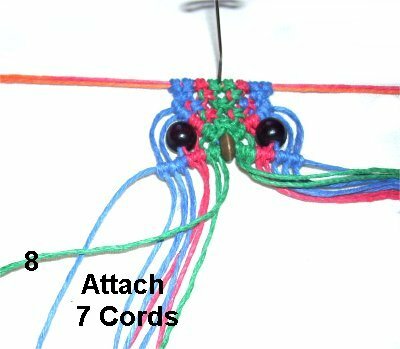 Place the beads for the eyes on cords 4 - 5, and on cords 12 - 13. Step 8: Move holding cord 16 to the left, so it passes under the left eye on a slight angle. Attach cords 8 - 2 to it with DHH, in that order. 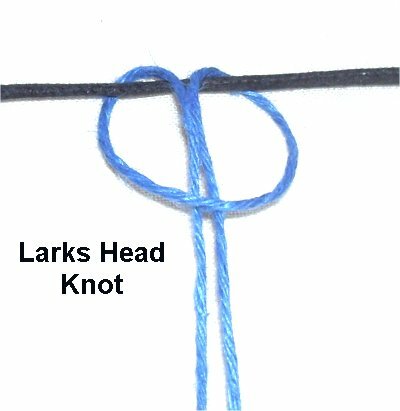 Rotate clockwise as you tie the knots, pulling them tightly so the eye rests against the row of DHH when you are through. 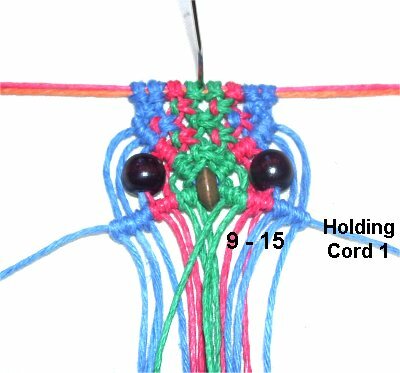 Move holding cord 1 to the right, so it passes under the right eye on a slight angle. Attach cords 9 - 15 to it with DHH, rotating counter-clockwise. 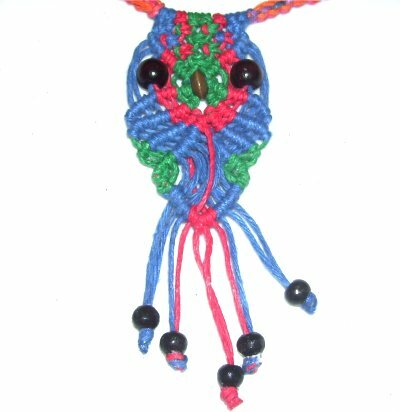 The right eye should rest against the knots when you are done with this area of the Rainbow Owl. Step 9: Locate cord 8, which is closest to the beak of the Rainbow Owl (on the left). Move it left, on an angle, since it will be used as the next holding cord. Attach 7 cords to it with DHH (cords 7 - 2 + cord 16). Rotate clockwise as you tie the knots. Design Tip: The rows of DHH for the wings can be arranged on any angle, and be either close together or with space between them. 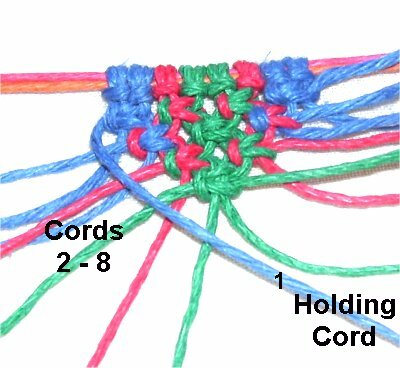 Do the same on the left, using cord 9 to hold the knots. Attach the remaining 7 cords to it with DHH (cords 10 - 15 + cord 1). The angle for this row should match the row of DHH on the left. 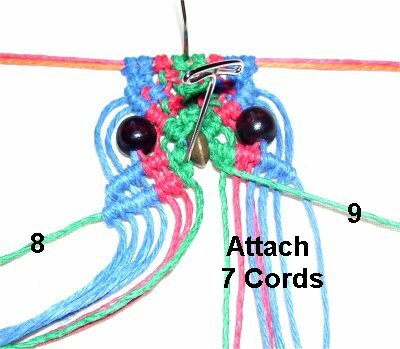 Step 10: To make the next set of wings for the Rainbow Owl, use cords 7 and 10 as the holding cords. Attach 7 cords to each of them with DHH, on each side. Don't worry about the numbering, it should be clear which ones to attach, since the two groups are separated. Step 11: Cross cords 6 and 11 as shown, and secure them with tension. They will be the final set of holding cords. Attach 7 cords to each one, as you did in previous rows. The upper portion of the diamond shape is the area between the wings. Now you will make the lower body area of the Rainbow Owl, and complete the diamond. Design Option: This is the time to decorate the inside of the diamond with a Square knot or bead. Do not use holding cords 6 or 11. Select two other cords to tie the Square Knot if you decide to use one. 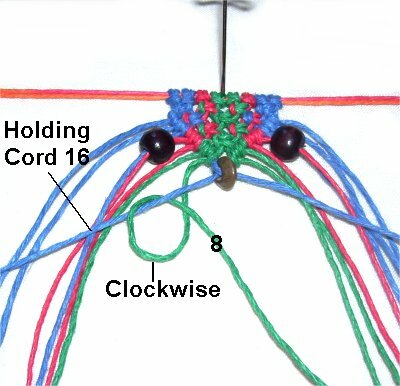 For beads, attach small ones to each cord, or one large bead to all of them. Step 12: Move holding cord 11 to the right, towards the center of the Owl. Place a pin at the corner on the left, to support the angle. Attach 7 cords to it with DHH, rotating counter-clockwise. Start with the cord closest to the pin. Step 13: Move holding cord 6 towards the center, and attach the remaining 7 cords to it with clockwise DHH. Attach holding cord 11 to it as well. 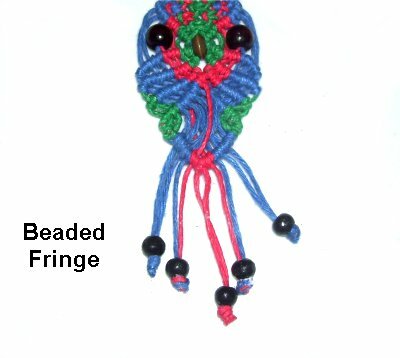 There are two ways you can finish the bottom of the Rainbow Owl -- a regular fringe, or a beaded one. Step 14: Bring the first and last 3 cords to the back of the pendant, and apply glue to hold them in place. This leaves 10 cords for the fringe. You can use all 16 cords if you wish. For a fringe that's not decorated, cut the cords on the same angle as the diamond. Apply glue to the tips of the cord, or use finishing knots. 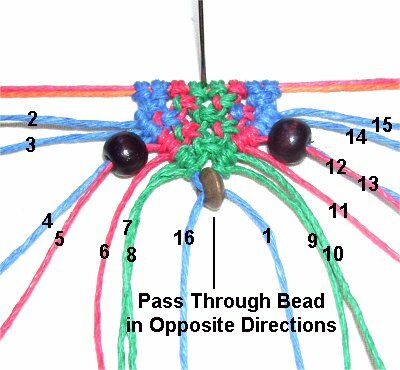 Beaded Fringe: Apply small beads to the cords, in groups of two. Tie an Overhand knot, applying glue inside as you tighten it. Add more glue to the outside. Cut off the excess material when the glue is dry. 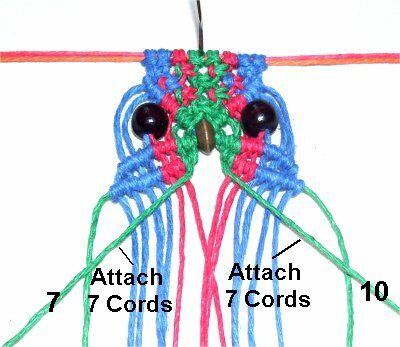 Step 15: Make the necklace using the two long cords that the Rainbow Owl is attached to at the top. Try to place knots close to the edges of the pendant, so it remains in the center. 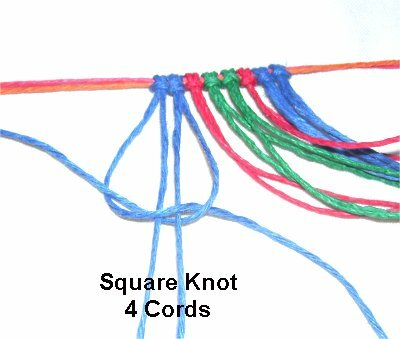 See the Learn Macrame section for suitable knots you can use. Have any comments about the Rainbow Owl? Contact Me.